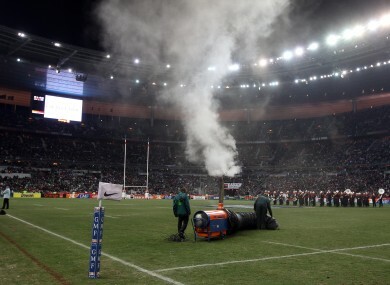 Stadium staff try to defrost the Stade de France pitch before the France v Ireland rugby international was called off. THE ORGANISERS OF the Six Nations tournament say they will make a decision “as soon as possible” – probably Monday – on when Ireland’s international fixture against France will be replayed. The game – originally set for 9pm Parisian time on Saturday – was called off just six minutes its scheduled kickoff, after officials expressed concerns about frozen sections of the Stade de France pitch and decided the possibility of injury was too high. In a statement released on Sunday, the International Rugby Board (IRB) backed referee Dave Pearson’s decision to postpone the clash, insisting that “player welfare and safety (was) the primary concern” after “the rapid deterioration of the playing surface between the final pitch inspection and the scheduled kick-off time”. The IRB added that it had no further comment to make and that “all questions relating to rescheduling of the fixture should be directed to the Six Nations committee”. While the temperatures in Paris had not been unexpected – with forecasts midweek projecting the temperature to fall to -7°C – the last-minute nature of the postponement angered many, not least the 10,000 Irish fans who had travelled to Saint-Denis for the game. The cancellation came despite a pitch inspection at 7:15pm by Pearson, who had then adjudged the pitch to be playable. In the following period, however, sections at the perimeter of the pitch froze over and it was feared that the pitch itself could succumb to similar conditions. The cancellation was so late that the stadium band had already emerged, and were ready to play the anthems. The tournament organising committee have largely maintained silence since – declining even to send any press circulars confirming the postponement or details surrounding it – with designated spokeswoman Christine Connolly (who had the duty of informing the crowd about the halt to proceedings) declining to comment on the decision. She merely said a date for an announcement of the new match could be made “as soon as possible”, though it is now understood that no meetings are planned for today given the Wales v Scotland game taking place this afternoon. Ireland coach Declan Kidney backed the decision to postpone the fixture, saying it was “very tough on one person”, referee Pearson, to have to make, “but I think in fairness to him he has made the right one”. “It was quite dangerous in one corner. The way the protocol is there is nothing you can do but prepare for the game so the lads are fairly pumped up in the dressing room and ready for a game. With the Six Nations calendar being particularly crowded, there are only two weekends in which no other games are due – meaning there are only two weekends in which a refixture can be held. The first of those weekends is next week, which would present a logistical problem: not only would 10,000 Irish fans have to try and find a last-minute way of getting to Paris, but the Stade de France is already scheduled to host a French Top 14 fixture. The other possibility is three weekends time – with March 2 already being floated as a prospective date. That would mean the game taking place on Friday night – a not unprecedented occasion, with Friday night games featuring in the last four championships. The possibility of another night-time kick-off is equally difficult, however – with many likely to question the logic of arranging another game with a late kick-off which could be equally hampered by cold conditions. Although it is one of the world’s more modern stadia – built in time for France to host the FIFA World Cup 1998 – the Stade de France does not have undersoil heating. This is because the stadium, built in the industrial district of Saint-Denis, is built on the site of an old gasworks – and it was feared that installing an underground heating system could cause an explosion. Moving the game back three weeks would also make the rest of the Six Nations campaign difficult for both sides: each would then have to play games on four successive weekends. Email “Updated: New France-Ireland date expected Monday, IRB back Pearson”. Feedback on “Updated: New France-Ireland date expected Monday, IRB back Pearson”.